Mix all of the dry ingredients together. Add half of the milk, all of the eggs, the butter, the TorchBearer Sauce and mix. Add milk until the batter forms. It doesn’t have to be blended completely, some lumps are okay. The batter should not be “soupy”, so be careful when adding the last part of milk, you may not need it all. These savory pancakes are really delicious. Try serving these tasty pancakes with the TorchBearer Sauce scrambled eggs for even more get up and go! 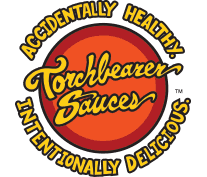 You could leave out the TorchBearer Sauce and put some Sugar Fire sauce on them instead!